The Samuel H. Abramson Memorial Research Fellowship (Abramson Fellowship) at Harvard University was established in 1983 by Edward and Harriet Abramson in honor of Edward’s father to support students conducting research on issues related to Israel and Jewish studies. However, when Edward passed away following a courageous battle with ALS in 2001, the focus of the fellowship shifted to support students conducting stem cell research particularly in the areas of ALS and neurodegenerative disease. Thank you to Prize4Life supporter and ALS advocate Harriet Abramson, as well as Professor Jeffrey Macklis, Professor of Stem Cell and Regenerative Biology at Harvard University and mentor to many of the students that receive the Abramson Fellowship, for the opportunity to get to know some of the most recent recipients of the Abramson Fellowship. 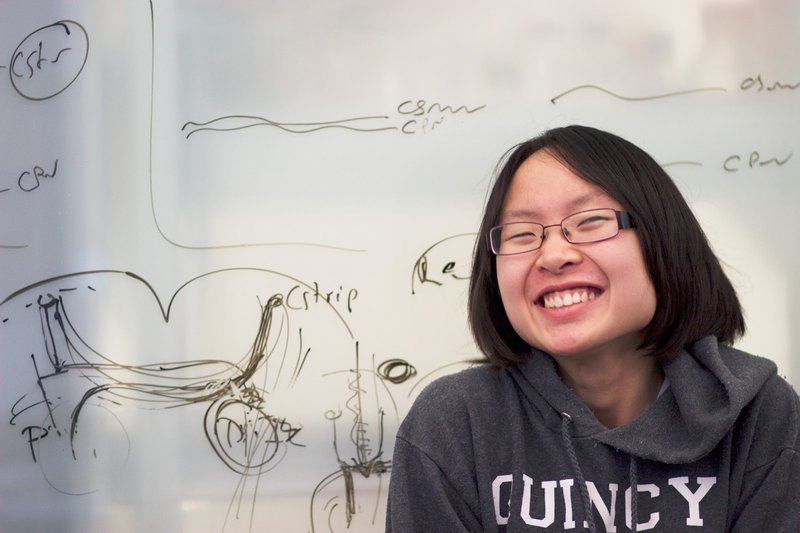 Harvard University senior and Abramson Fellow Janet Song grew up just outside of Philadelphia in Audubon, Pennsylvania. Janet’s interest in science began when, as a sixth grader, she started participating in science fairs. Her passion for science continued to develop throughout middle school, and as a freshman in high school, Janet was inspired to conduct cancer research at Drexel University College of Medicine under the guidance of Dr. Timothy Block. Janet made significant progress on her research project, which was to develop a urine-based test that could be used for the early detection of cancer, qualifying her as a finalist in the 2009 Intel Science Talent Search. She went on to become her high school’s valedictorian before entering Harvard in the fall of 2009. In addition to her impressive academic work, Janet is an accomplished musician; in 2004 she won the World Piano Competition and she has also performed at Carnegie Hall. When she is not in lab, Janet is an avid Philadelphia Eagles fan and enjoys playing video games. We recently asked Janet to share her thoughts about being awarded an Abramson Fellowship in the summer of 2012 and how her research at Harvard will impact the understanding of neurodegenerative diseases such as ALS. A: I currently work with postdoctoral fellow Dr. Vibhu Sahni to characterize the role of a particular gene in corticospinal motor neuron (CSMN) development. We are specifically looking at how this gene regulates CSMN axon outgrowth. This research has direct applications for ALS. The information that we are learning from these studies may allow us to identify ways to keep motor neurons connected to the muscles they support and control. In addition, my current work may also help people with spinal cord injuries. My research is giving us clues about how we could potentially regenerate CSMN after spinal cord injury. Q: Why did you choose to focus your research on neuroscience? A: I have always been very interested in neuroscience. As a junior in high school, I had the opportunity to work in Dr. Gordon Harris’ laboratory at Massachusetts General Hospital. In Dr. Harris’ lab, I took a macro approach to neuroscience research -- I used magnetic resonance imaging (MRI) to study the effects of alcohol on the size of the brain. As a high school senior, I decided to attend Harvard University for college because I knew it would be a rich environment filled with experts working in molecular biology and genetics, especially in the field of neuroscience. After joining Harvard as a freshman, I knew I wanted to understand how the brain works at the molecular level. I decided to work in the Macklis laboratory where I am now using a variety of molecular biology techniques to understand how neuronal growth is regulated. A: Working with Professor Macklis and the other members of the Macklis lab, including fellow Abramson Fellowship awardee Chris Devine, solidified my decision to pursue a career in science. While I do not focus too extensively on the potential clinical applications of my research, I am motivated by knowing that my work may someday help people that are living with neurodegenerative diseases such as ALS. ALS is a terrible disease that often affects people in the prime of their lives. With so little known about this disease, I am inspired to do what I can to help patients live longer, happier, and more productive lives. A: Working in Professor Macklis’ lab has allowed me to learn more about designing experiments and how to think about scientific problems. I have learned the value of perseverance and consistent hard work. The fact is most experiments do not work, but you have to keep trying. Even though 99% of the time my experiments fail, it is the one time the experiment works which motivates me to continue my research. Working in Professor Macklis’ lab and learning these extremely valuable lessons have made me realize that I want to pursue a career in scientific research. After I graduate from Harvard in May, I will attend Stanford where I will pursue a Ph.D. in genetics. After that, I hope to hold a position as a postdoctoral fellow where I will prepare for an academic research position. A: If we look back many decades, before recent medical advancements, many common diseases and ailments were potentially fatal. What we have learned over the past few decades is that there is hope for those afflicted with conditions that were once deemed incurable. Just thirty years ago, those diagnosed with HIV/AIDS were given a death sentence. In a relatively short period of time, HIV/AIDS has become a manageable disease and patients are given the chance to live long and fulfilling lives after diagnosis. It is my hope this will soon be the case for ALS. Although we do not currently have effective treatments or a cure for ALS, I am optimistic that we will continue to make scientific discoveries that will lead to the discovery of these effective treatments and cures, giving hope to ALS patients around the world that are battling this debilitating disease.